Cloned from 3LEGDR0ENZEPH4LOGR4FF by Neoqueto. 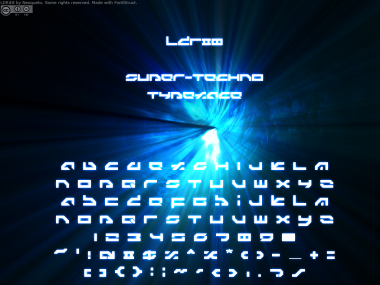 A font based on 3LEGDR0ENZEPH4LOGR4FF. Publishing this one day after my birthday, ahh, I wanted some stars and hearts as a present from you :P. For me, this is one of my best creations I've ever done. I think it came out really not bad, the production was delightful, so I'm thinking about expanding the character set, if I'll find some time. Wide, fat, blocky and simple-shaped. Lowercase and uppercase basically don't differ, but some characters have various sizes here and there, usual to obtain clearer look for logotypes, to fit some letters with each other. Info: Created on 20th March 2011 . Last edited on 5th June 2011. Oh... And Happy birthday to you, finally my "New Species" were done at the perfect moment ! We're so "telepathic" sometimes it's almost scary! Excellent - I love the solution for 8.